For gardeners, those final hours of October are a time of fear and loathing; for young boys, a time for mischief. But for young maidens, it’s a time for love and romance. Strangely, what brings them all together on Halloween night is … cabbages. 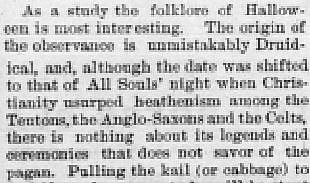 “Cabbages have always figured effectively in Halloween practices,” according to the New North-West. “Why, it would be difficult to tell; just what occult power a cabbage possessed has never been defined; but certain it is that these innocuous plants usually have a rough time of it on Halloween,” to the dismay of gardeners. “In Scotland, the girls went forth at midnight and each pulled a cabbage from the earth. Of course, young boys not yet of the romantic age found other wonderful properties in cabbages. Other produce comes into play on Halloween. “Over every door to house, room or barn, an apple paring was hanging, and some maiden’s eager eye was watching for him who first passed beneath, for that one the fairies had charmed as her beloved.” Apple seeds were also used to determine romantic pairings. 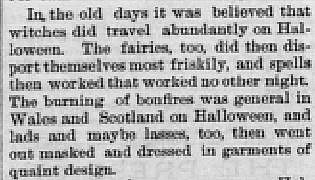 Feel free to blame 18thand 19thcentury England for some of the “tricks” of Halloween. 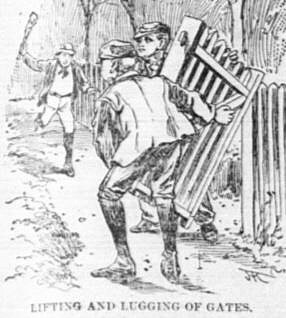 As part of a May Day ritual called “Mischief Night,” garden gates were favorite targets of mischievous boys. Over the years, the tradition of gate appropriation and other pranks moved from May to late October. If garden gates were in short supply, youthful miscreants extended the custom to porch furniture and other items. In 1888, the New North-West noted the “transfer (of) the undertaker’s sign board to the doctor’s office, painting dragons on the minister’s house and putting a stuffed donkey at a professor’s desk or (on) the preacher’s pulpit” as pranks popular in the day. The custom of “wheel switching” caused “W. 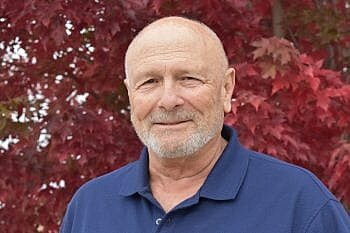 H. McWilliams (to get) pretty warm,” according to a November 1894 report in the Philipsburg Mail. Halloween, with all its mischief, hasn’t set well with a lot of folks. Thankfully, these days, I no longer have a garden gate to be snatched in the night and my sign boards have been retired. However, I do wish my wife had picked a cabbage with slightly more svelteness and beauty.